I think one can get my point from the above pictures. And these are the watered down versions that can be found doing a quick yahoo or google image search. 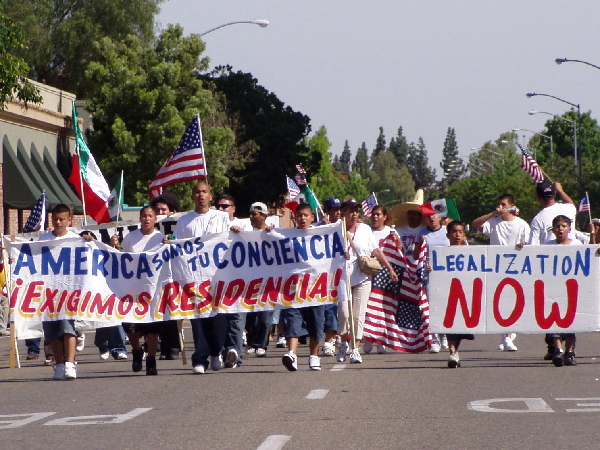 People choose to look at these mass demonstrations as citizens demonstrating their rights, but he fact is that most of the people in these photos are more than likely illegal and are making their demands in a political manner with the assistance of organizations such as La Raza and Lulac. I've known people that were at these demonstrations in Dallas who were physically and verbally abused because they dared show up to voice their opinions. This is not a friendly bunch that will integrate into our society and become loving citizens of this country. On the contrary, they have already stated their goals time and time again. Stay on topic everyone and refrain from personal attacks, please, or this thread will be closed. Thank you. And here are more pictures to take into consideration. Demands, demands, from people that are in our country ILLEGALLY. They're so proud to be here, but the flag most fly is from their home country, where their true allegience lies. Of course, the socialist workers part is behind much of this.. With more DEMANDS, of course. A flag from yet another country rather than the one in which these people wish to live..
And they have the solution, of course. Can you guess what that might be? In some parts of the country (our country), mobs took down the american flag and replaced it with the one the "immigrants" believed should be in its place. Of course, those who are sympathetic to the illegal immigrant plight will choose to leave out certain words that are descriptive of the problem, such as ILLEGAL. Let's just make this all one big country, see? There are no needs for any borders, we're all just buddies. Justice for whom? Is it justice for the millions (from Latin America and elsewhere) that wish to come here legally? Where is the "justice" for those that are bumped by the system by trying to follow our laws? Please let me know how that is "justice." And more demands for "full rights" even though they refused to obey our laws in coming here. People, I have no problem with Hispanics, Pakistanis, Chinese, Greeks, Germans, Canadians, or anyone else wanting to come to this country. I would want to be here as well. The simple fact is we CANNOT swing open the gates and just let everyone in. We are a sovereign nation that has a right to execute a system of checks and balances whereby people come into this country legally. Amnesty for those who have broken our laws is not the answer. And if you think that I'm picking on Hispanics, it's not true. The only reason these pictures reflect people of mostly Hispanic background is because these are by and large the biggest demographic in the rallies that took place earlier this year. Also, the Hispanic leadership has been much of the driving force behind many of these demonstrations and demands on the American people and system. Some interesting pictures for sure! I see there are pictures of "Che" Guevera in there as well as a newspaper about a guy wanting sovereignty for Puerto Rico. If businesses that hire illegals and landlords that rent to illegals were punished, the problem would fizzle out due to attrition. The carrot that is dangled before the illegal immigrant population would be taken away and over the course of several years, many would return home. Those that choose to stay and live on the fringes of society would have to be arrested and deported over time. The huge influx of illegal immigrants across the border would slow down to a trickle over time as well. It seems that most of you are complaining about Mexican illegal immigrants, because I have not heard a thing about complains about other illegal immigrants from other countries. 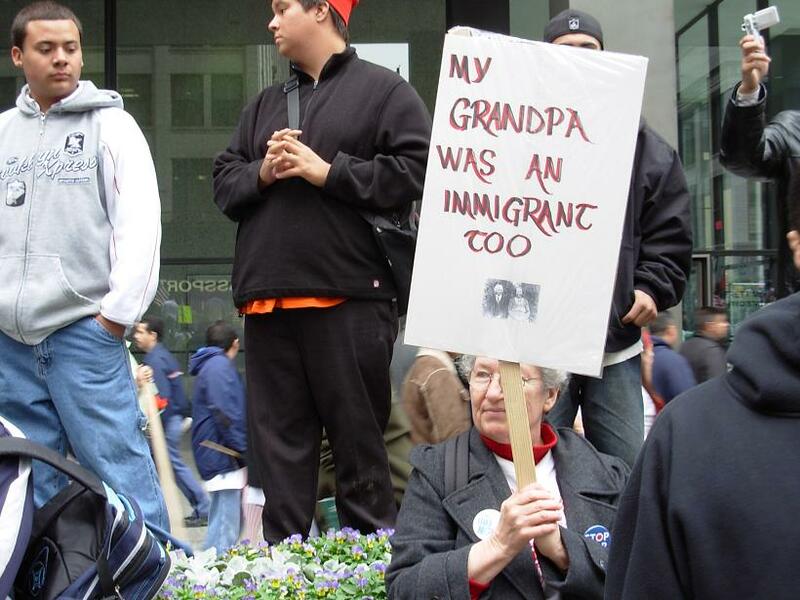 It certainly might due to the smaller number of such other immigrants. Not ALL illegal immigrants are bad for the US and our economy. The majority of illegal aliens present in the U.S. are Mexican foreign nationals. The vast majority. The percentage of other foreign nationals that actually make it into the U.S. is miniscule in comparison. And yes, ALL illegal immigrants are bad for the U.S. and our economy. I physically cringe when exploitative politicians and business owners whine that if it weren't for illegal aliens, the econmony or their businesses would suffer. When did it become okay to profit by criminal activity? Hiring illegal aliens is a Federal crime. If some contruction business owner,et.al., cries that they'll lose money if they don't hire illegls, so be it. Those companies should be less rich. Crime shouldn't pay. And illegal immigraion is about crime not race. "Mexican" is not a race, it's a nationality. The "their-only-coming-here-to-work" myth that's being perpetuated hurts our country. The U.S. can simply not absorb the vast numbers of uneducated third worlders illegally crossing its borders. Americans of all ethnic backgrounds suffer when crime is tolerated. This is from Numbersusa.com. If you don't think there is an agenda behind this, you are mistaken. Our government is explicitly involved in this and something needs to be done. Take a look at what happened to two border guards that were fulfilling their duties as law enforcement officers (below). People like this need our help folks. While families all over America were celebrating the Christmas holiday, two American families were preparing to say goodbye to their husbands and fathers. In the rush to buy presents and trim the tree, you may have forgotten Ignacio Ramos and Jose Alonso Compean -- at least it would seem that our government has forgotten about them -- or WANTS to forget about them. Compean and Ramos are the two U.S. Border Agents wrongfully convicted and recently sentenced to a combined 23 years in prison for attempting to arrest Osbaldo Aldrete-Davila, an illegal alien who was smuggling drugs from Mexico into the U.S. The Agents spotted Davila driving a van, loaded down with 743 lbs of marijuana, already on American soil. When Davila realized he was about to be captured, Davila abandoned the van and took off running toward the Mexican border. Ramos, a federal officer, tried to block his way. Davila knocked him down. Compean, after seeing his partner on the ground, and seeing what he thought at that instant was Davila brandishing a nickel-plated pistol, opened fire. Davila turned and ran back across the Mexican border and escaped in another van -- apparently unhurt. Some two weeks later, Johnny Sutton, the U.S. Attorney for that part of Texas, claimed that Davila's mother called the mother-in-law of a Border Agent in Arizona and told him that Davila had been shot in his illegal, dope-dealing rear by a Border Agent. And Sutton -- apparently outraged that two law enforcement agents would actually try to enforce the law... apparently outraged that a dope dealing piece of scum was shot in the buttocks -- ordered a full-scale, no stone un-turned, investigation of COMPEAN AND RAMOS! And here's the kicker! Instead of calling the two agents into headquarters, the Department of Homeland Security sent two SWAT teams to stage a high-profile arrest at each house, during which they bullied the two men and their stunned and terrified families. What was DHS thinking... that Compean and Ramos would try to flee across the border? You're absolutely right......illegal is illegal, period. I've been around it my entire life--and it has only gotten worse over the last 20 years. They do need our help....and the arrest and conviction of these BP agents for doing their job PROPERLY with drug dealing scumbags is a total outrage. It is just too bad that illegals have any rights in this country at all. We are saps for putting up with this on any level. Cathy media stories of arrests are very invalid. These arrests and treatment of BP agents is a little overboard. Maybe, the BP agents helped them get away, or they were innocent bystandards. You don't truly know unless you were there!